Times are changing and fewer and fewer young couples are choosing traditional wedding ring designs for their big day. 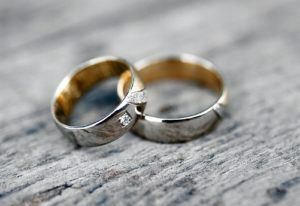 Now it is common for couples to search for custom wedding rings that match their personality and style. Are you curious about what kinds of custom designs are available for your wedding ring? 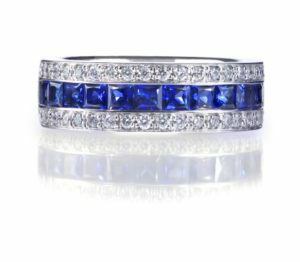 Many couples are turning away from diamonds and looking to colorful stones to adorn their wedding bands. Opals, moonstones, sapphires and other gem stones make great focal points and are often less expensive than a high-end diamond. Plus, you may be able to find a stone that has a special meaning just to you. This is also a good time to mention the trend toward uncut stones these days. Instead of purchasing a cut and polished diamond, consider a raw stone in all of its natural beauty. This often gives you an asymmetrical fitting and interesting features. Not only are couples changing their take on diamonds, many are also looking at alternative materials for the wedding band. Today you can find custom engagement rings hand carved out of natural woods. You can buy men’s wedding bands with carbon fiber inserts, guitar string inserts and plenty of other hobby-related themes. Some couples are doing away with stones altogether and opting for intricate metal bands instead. For instance, a thin rose gold ring with a knot or twist on top, or a plain gold band engraved with names and a date. A couple here in the Falls Church/Washington D.C. area even had a favorite saying engraved on the inside of the ring. There are millions of unique ways to combine stones of all kinds with popular metals to create something nobody else has. Even if you choose to go with an unconventional stone or metal, you can still include diamonds or yellow gold with a two-tone look. Dominion Jewelers has a team of highly skilled professionals available to consult with you on the design of your custom wedding bands. Contact us today to schedule your first consultation.